Liverpool and Manchester City shared the points in a game that many considered the biggest in the Premier League so far this season. The result leaves both on 20 points after eight games, but Pep Guardiola’s side sit first, ahead of Chelsea and then the Reds on goal difference. It was a contest that failed to live up to high expectations, with Riyad Mahrez’s penalty miss in the 85th minute the main talking point. Virgil van Dijk had been adjudged to have illegally brought down Leroy Sane in the box, but Mahrez, who took the ball off unhappy teammate Gabriel Jesus on Guardiola’s instructions, blasted his effort over the crossbar in front of the despairing away fans. 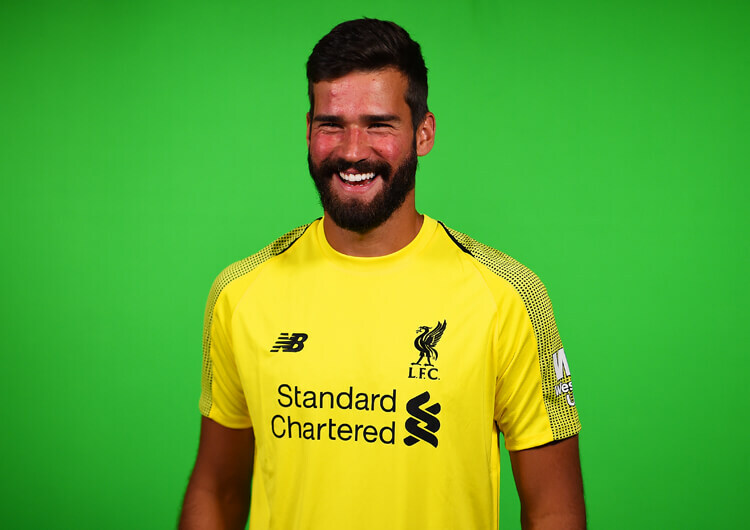 Despite a largely untroubled afternoon for opposing Brazilian goalkeepers Alisson and Ederson, both teams will be pleased to have maintained their unbeaten starts to the campaign. After their draw away at Chelsea, head coach Jurgen Klopp made just one change to his Liverpool side. 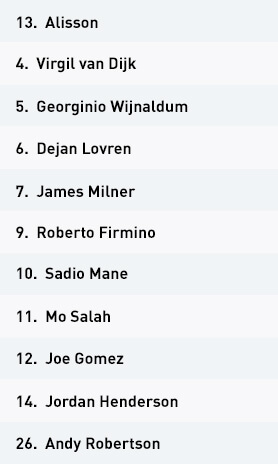 Dejan Lovren was handed his first Premier League start of the season, replacing Trent Alexander-Arnold, as Joe Gomez moved across to right-back role in a familiar 4-3-3 structure. With Manchester City insistent on building from goalkeeper Ederson, Liverpool pressed very high from the outset. The front three of Sadio Mane, Roberto Firmino and Mo Salah would step high on to both central defenders and lone pivot Fernandinho. James Milner would then support his team’s high press if Bernardo Silva dropped deeper to create a double pivot in between his splitting centre-backs, reducing the Portugal international’s ability to turn and play out against the pressure. This press from the front unit intelligently blocked access between the visitors’ central defenders; right-back Kyle Walker was eventually forced to drop even deeper to provide an additional passing option for the centre-back in possession. The hosts enjoyed the majority of play in the opening exchanges, as a result. 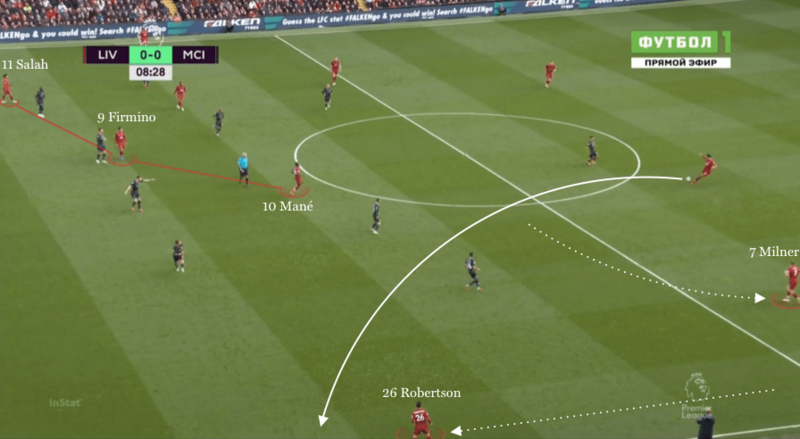 Intense midfield pressing, coupled with the high positioning of Mane and Salah, created the opportunity for quick transitions forward into attack. The pressure that Firmino added in dropping into midfield also helped the Reds to regain the ball quickly, as Bernardo Silva and David Silva struggled in midfield against four pressing players. City weren’t without a response, though, and they soon started to find success in playing out from the back. Riyad Mahrez and Raheem Sterling would remain high to pin Liverpool’s full-backs, allowing Walker to receive in front or over the pressing forwards before moving the ball out of defence against minimal pressure. 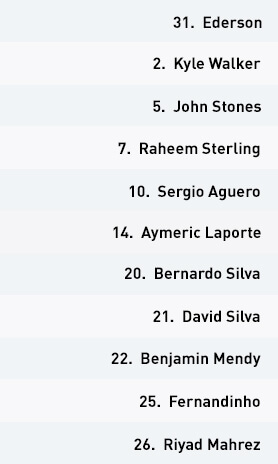 Liverpool targeted Benjamin Mendy as a source of possession. The left-back frequently lost the ball through telegraphed passing into Fernandinho and David Silva, while his high positioning could be exploited by the speed and directness of Salah on the right. But for an assured first-half performance from Aymeric Laporte – who often came out on top in his one-on-one battles with Salah – the Reds might have posed more of a threat on the break. Klopp’s players also favoured building from the goalkeeper, and they continued with this in the second half.  With Sergio Aguero and David Silva forming a front two in City’s out-of-possession structure, the visitors struggled to effectively pressurise their opponents’ back line. 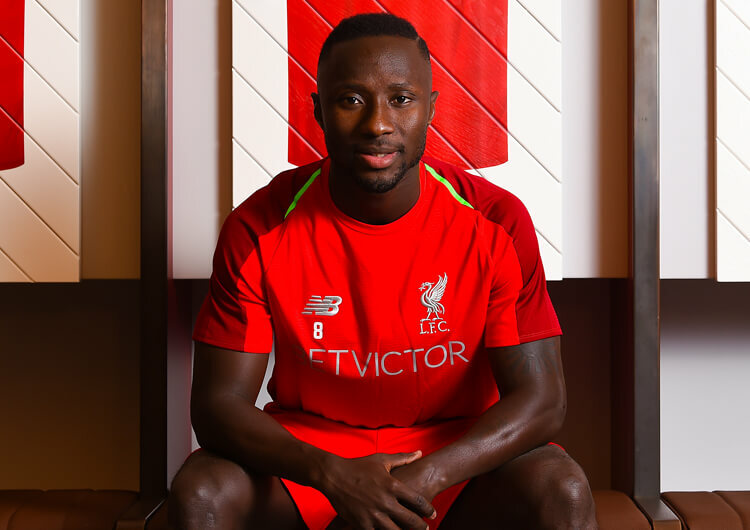 As Gomez and Andy Robertson looked to move outside of the midfield block, Georginio Wijnaldum or Naby Keita (James Milner’s first-half replacement) could move into a false full-back role, helping to progress the ball around the front pairing with ease. It was progressing the ball into the next line that Liverpool found difficult. They looked dangerous only when they had regained possession high through pressing. Mane and Firmino regularly dropped towards the ball from a high starting position, receiving between the lines after a switch of play. 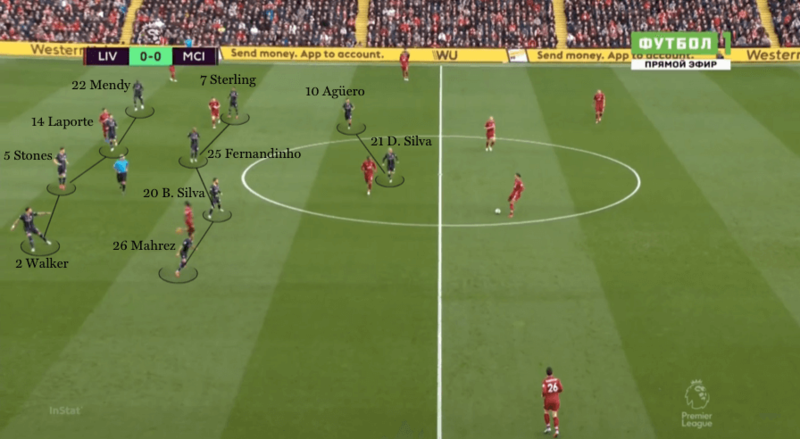 While City did leave gaps to play through when shifting across, the compactness between their units was consistently solid, affording Liverpool minimal time and space on the ball to progress further. Gomez’s well-timed forward runs from right-back became a common outlet. 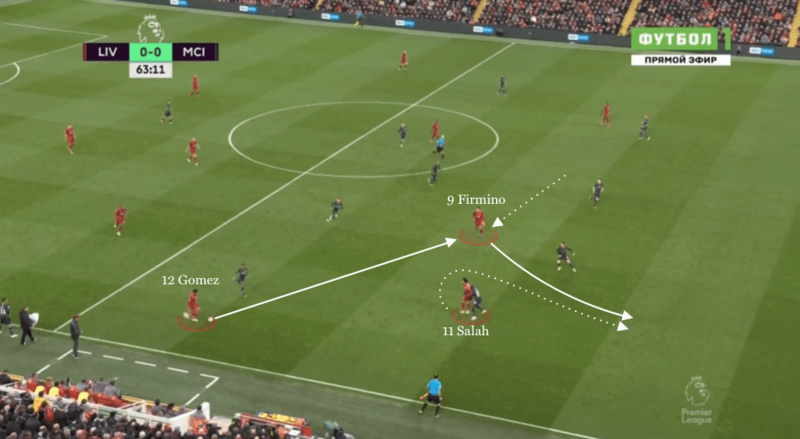 Direct passing from Jordan Henderson and Wijnaldum to Gomez out wide enabled Salah to move inside earlier, where he found more space to receive and combine with the dropping Firmino. Salah could then receive back inside the right shoulder of Mendy before cutting across the full-back and driving on goal. City weren’t averse to committing tactical fouls to thwart the Liverpool threat on the right, leaving goalkeeper Ederson untroubled. Daniel Sturridge replaced the tiring Firmino with just under 20 minutes remaining, but the in-form striker added little to his side’s attacking play. It was the visitors who could have won the three points in the closing stages, with Mahrez’s miss from the penalty spot five minutes from normal time the final opportunity for either side to break the deadlock. Despite possessing more of the ball in the second half, Liverpool simply couldn’t break their opponents’ compact and effective defensive block. In possession, with Manchester City remaining in their mid-block, Liverpool often looked in behind for left-back Andy Robertson. James Milner would move into a false full-back position when Robertson moved forward, pulling in Riyad Mahrez. 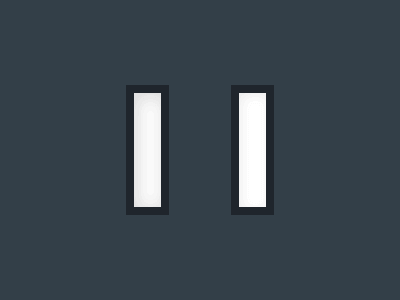 The front line also moved inside, looking to receive close to one another between the lines. Liverpool maintained their 4-3-3 when defending, but soon lost the intensity they displayed in the opening stages. They eventually dropped into a mid-block, blocking City’s access into David Silva. 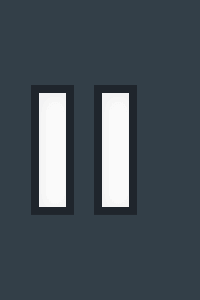 Joe Gomez’s higher positioning from right-back in the second half enabled Mo Salah to move inside left-back Benjamin Mendy’s right shoulder. Then, through Roberto Firmino, Liverpool looked to get Salah in behind their opponents’ back line. 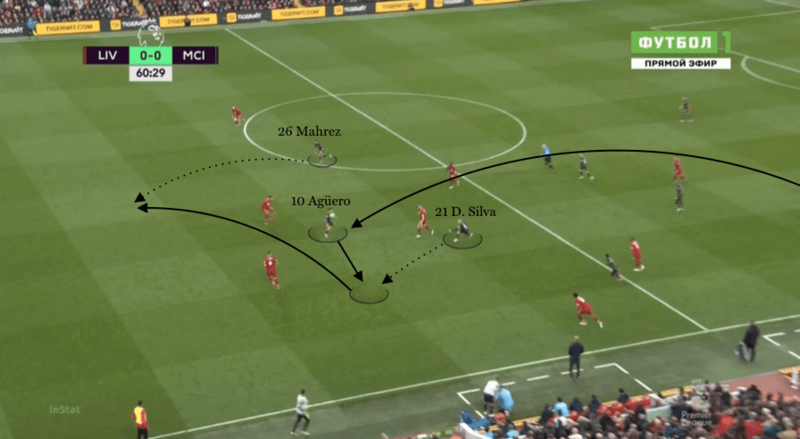 As City gained control of possession against Liverpool’s mid-block, right-back Kyle Walker remained part of the back line, with Mendy moving higher to join the double pivot of Fernandinho and Bernardo Silva. City’s 4-2-3-1 converted into a congested 4-4-2 block when defending. Mahrez and Raheem Sterling would drop back to form the midfield unit, while David Silva stepped up to support Sergio Aguero. With David Silva positioned much higher, City exploited his intelligent passing range to work the ball in behind on the break. 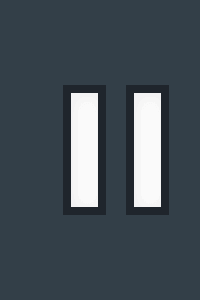 This, combined with Mahrez’s running and Aguero’s link-up play, saw City create more chances in the second half. Pep Guardiola made three changes for the visit to Anfield, with Nicolas Otamendi and Oleksandr Zinchenko replaced by John Stones and Benjamin Mendy in the back line. Riyad Mahrez also came in for Leroy Sane on the right side of the attack, with Raheem Sterling moving over to the left. Manchester City immediately played back to goalkeeper Ederson from kick-off, as they looked to quickly establish their dominance in possession. Liverpool’s front line, however, refused to allow them to settle, maintaining high starting possessions when the ball was at the goalkeeper’s feet. 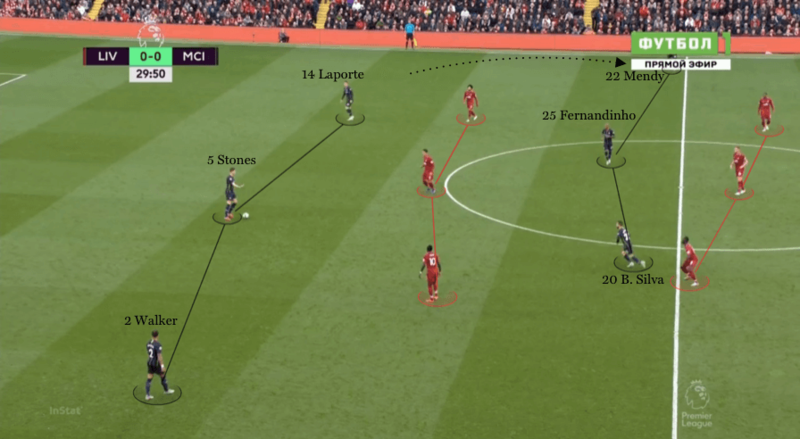 Kyle Walker was eventually forced to drop deeper to form a temporary back three with Stones and Laporte – this then allowed Mendy to move into the next line, as Fernandinho provided central support for Stones in the cover shadow of Roberto Firmino’s press. The relentless pressing of Firmino in the opening spell made it difficult for David Silva and Bernardo Silva to impose their passing game further forward. Against a pressing central midfield unit and a dropping Firmino, City struggled to link defence to attack. They spent a considerable amount of time in the first half out of possession, moving into a 4-4-2 structure that saw Raheem Sterling and Mahrez drop back, and David Silva push higher to accompany Sergio Aguero. 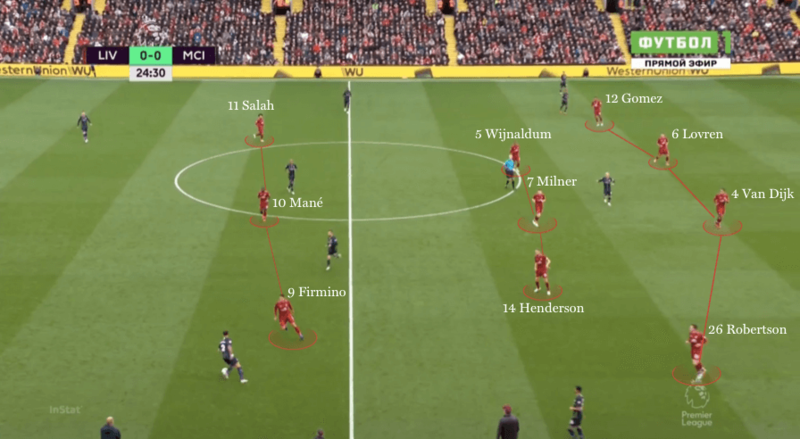 The intensity of Liverpool’s press naturally started to fade into a more consistent mid-block – and this enabled City’s midfield to assert themselves in possession. Mahrez often looked to step off the right touchline and receive inside left-back Andy Robertson, before looking to move the ball on to his stronger left foot and combine with Aguero in the central lane. Walker interestingly remained conservative, staying with the back three and rarely overlapping his teammate. 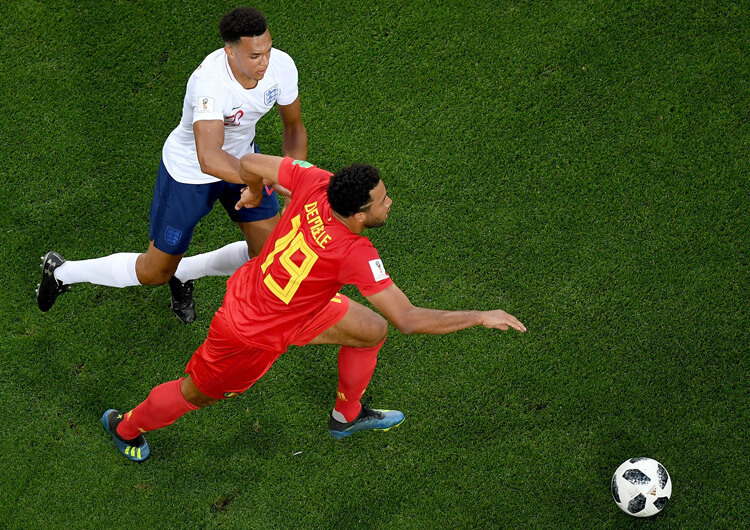 On the rare occasion the England international did move ahead of Mahrez, City comfortably moved into the final third through their right side – usually after a long switch from the left that had avoided a pressing central midfield unit. City favoured a conservative approach, though, and this continued into the second half. Sterling, Mahrez and Aguero rarely committed their man with the ball, choosing to maintain short, safe passes instead of more expansive dribbles forward. Content in a defensive mid-block, they were comfortable out of possession and allowed Liverpool to take control of the ball for a large period after the break. Their slick passing combinations started to emerge during moments of transition, however, as David Silva’s now higher positioning allowed for much earlier link-up play with Aguero. Mahrez troubled the back line with diagonal runs that provided David Silva with the ideal third-man target to find in behind. They repeatedly regained possession in the midfield third for a spell midway through the second half, and became more direct with their passing. This added an element of risk to their play, though, as playing to the highest passing option each time after a regain is difficult to consistently perform. The game consequently descended into rapid transitions within midfield, but little progress on goal from either set of attackers. Guardiola replaced Aguero and Sterling for Gabriel Jesus and Leroy Sane in the second half. Jesus troubled Dejan Lovren in moving out to the left inside channel to isolate the centre-back on this side, yet City’s major chance to steal the three points came from the penalty spot in the 85th minute. Sane was brought down inside the box by Virgin van Dijk, and a penalty was correctly awarded – but Mahrez, who took the ball from Jesus on his manager’s instructions, blasted his effort well over the crossbar. In the end, City still gained a valuable point from Anfield, and head into the international break top of the Premier League after eight games.